Whether for use in safe data encryption, ultrafast calculation of huge data volumes or so-called quantum simulation of highly complex systems: Optical quantum computers are a source of hope for tomorrow's computer technology. For the first time, scientists now have succeeded in placing a complete quantum optical structure on a chip. This fulfills one condition for the use of photonic circuits in optical quantum computers. Whether for use in safe data encryption, ultrafast calculation of huge data volumes or so-called quantum simulation of highly complex systems: Optical quantum computers are a source of hope for tomorrow's computer technology. For the first time, scientists now have succeeded in placing a complete quantum optical structure on a chip, as outlined in the Nature Photonics journal. This fulfills one condition for the use of photonic circuits in optical quantum computers. "Experiments investigating the applicability of optical quantum technology so far have often claimed whole laboratory spaces," explains Professor Ralph Krupke of the KIT. "However, if this technology is to be employed meaningfully, it must be accommodated on a minimum of space." Participants in the study were scientists from Germany, Poland, and Russia under the leadership of Professors Wolfram Pernice of the Westphalian Wilhelm University of Münster (WWU) and Ralph Krupke, Manfred Kappes, and Carsten Rockstuhl of the Karlsruhe Institute of Technology (KIT). The light source for the quantum photonic circuit used by the scientists for the first time were special nanotubes made of carbon. They have a diameter 100,000 times smaller than a human hair, and they emit single light particles when excited by laser light. Light particles (photons) are also referred to as light quanta. Hence the term "quantum photonics." That carbon tubes emit single photons makes them attractive as ultracompact light sources for optical quantum computers. "However, it is not easily possible to accommodate the laser technology on a scalable chip," admits physicist Wolfram Pernice. The scalability of a system, i.e. the possibility to miniaturize components so as to be able to increase their number, is a precondition for this technology to be used in powerful computers up to an optical quantum computer. 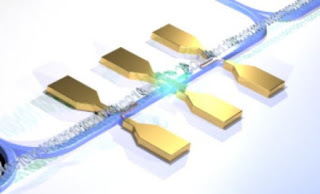 As all elements on the chip now developed are triggered electrically, no additional laser systems are required any more, which is a marked simplification over the optical excitation normally used. "The development of a scalable chip on which a single-photon source, detector, and waveguide are combined, is an important step for research," emphasizes Ralph Krupke, who conducts research at the KIT Institute for Nanotechnology and the Institute of Materials Science of the Darmstadt Technical University. "As we were able to show that single photons can be emitted also by electric excitation of the carbon nanotubes, we have overcome a limiting factor so far preventing potential applicability." About the methodology: The scientists studied whether the flow of electricity through carbon nanotubes caused single light quanta to be emitted. For this purpose, they used carbon nanotubes as single-photon sources, superconducting nanowires as detectors, and nanophotonic waveguides. One single-photon source and two detectors each were connected with one waveguide. The structure was cooled with liquid helium to allow single light quanta to be counted. The chips were produced in an electron beam scribing device. The scientists' work is fundamental research. It is not yet clear whether and when it will lead to practical applications. Wolfram Pernice and the first author, Svetlana Khasminskaya, were supported by the Deutsche Forschungsgemeinschaft and the Helmholtz-Gemeinschaft, Ralph Krupke was funded by the Volkswagen Foundation..